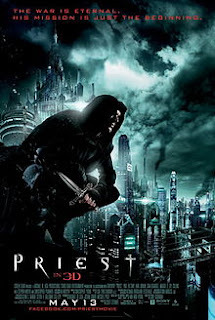 “Remember, to go against the Church is to go against God,” is a lesson repeated incessantly by clergy and public address systems in the 2011 film Priest (not to be confused with the 1994’s Priest, which is entirely vampire free). You can look at this concept from a couple of perspectives. In Scripture, the Church is the Body of Christ, and so that teaching is true -- but we also know that individuals in the Church, even (sometimes especially) clergy in the church, do very unChristlike things. Opposing those actions and those people isn’t just okay; it’s the right thing to do. Throughout history, clergy have said and done things that were wrong. Misogyny and racism have been preached. Right now people in some churches teach diametrically opposed things about sexuality from people in other churches. Someone must be getting things wrong. In this film, the church hierarchy is teaching false things about vampires. The film (based on a graphic novel) lays out its cosmology in an animated preface, “This is what is known: there has always been man, and there have always been vampires. Since the beginning, they have have always been in conflict. Vampires were quicker and stronger, but man had the sun -- but it was not enough. The two races threatened to destroy not only each other, but the world itself. But when the vampires seem to be under control, these Priest Warriors are driven from ministry into obscurity. The Church hierarchy wants people to remain in the Cities under their control, but when the Priest with No Name (Paul Bettany taking the role because Clint Eastwood inexplicably passed on it) learns there have been vampire attacks in colonies outside the Cities, he urges action. 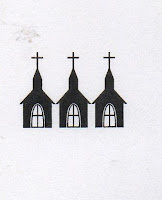 The Church Hierarchy claims they weren’t really vampire attacks and forbids the Priest from investigating the attacks. When the Priest says that he won’t obey those orders, the Church sends men to restrain him, but they are no match for the combat ability of the Priest. Soon he is out in the Wastelands. The vampires are supposed to stay on Reservations, and the Priest goes to one of those, only to find that the vampires have overcome their guards and are on the loose. The danger to the humankind, and the Cities is real. Nonetheless, the bishops send out a team of four priests to capture the Priest. 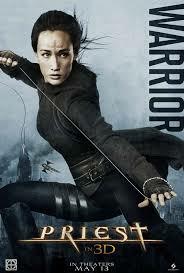 There is even a priestess in the priest posse (played by Maggie Q). Three of the male priests are killed by vampires. 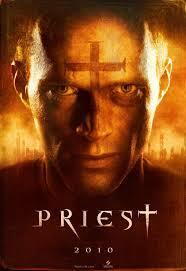 Not surprisingly, the Priestess teams up with the Priest. One of the things I really liked about the Priests in the film is that before any of them go into battle, they quote from the Psalms (usually Psalm 23, a favorite in films). The Priests are obviously going out trusting the power of God. 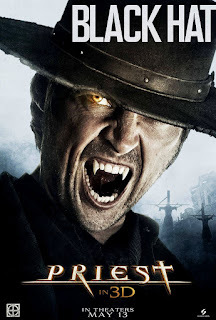 But the Priest must eventually face the Big Bad, a fallen priest, Blackhat (Karl Urban), a former comrade of the Priest’s who was turned into a vampire. When Blackhat plans an attack on the Cities, the Church hierarchy must admit they were wrong and support the Priest in his return to battle (in a sequel that was not to be). So, is it right to oppose the Church when it is wrong? Of course, because one of the ways we support the Church is to help it do the right thing. If you’re a Christian, you aren’t just in the Church, you are the Church -- so we should never “go against the Church.” We should always, however, strive to make the Church act as the Body of Christ. And fight vampires. 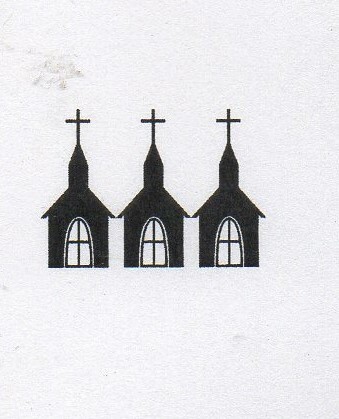 The Good Fight of Priests and the Head in the Sand Attitude of the Bishops averages the Church rating in Priest to 3 Steeples.